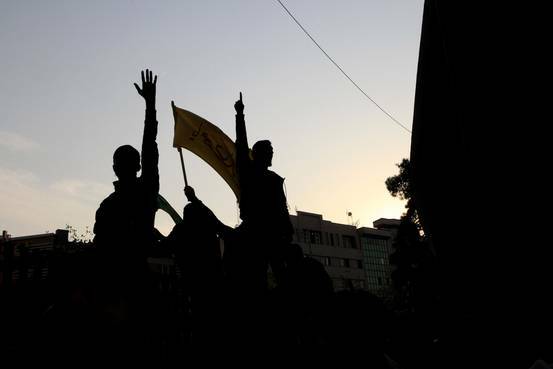 WASHINGTON—The Trump administration was caught off guard by the unfolding protests in Iran and is now wrestling with how to deter Tehran from carrying out a broader crackdown on dissent, senior U.S. officials said Wednesday. With antigovernment protests spreading across Iran, the U.S. is relying on presidential tweets, public condemnation and international pressure aimed at ​swaying—but not toppling, officials say—Iran’s leaders. The domestic protests have created an unpredictable new challenge for the Trump administration, which has focused most of its attention on deterring Iran from destabilizing its rivals in the Middle East. Now, administration officials say, they are trying to figure out how they can capitalize on the internal protests to change Iran’s behavior at home and abroad. At least 21 demonstrators have been killed and hundreds more arrested in a week of protests that unexpectedly spread across Iran. On Wednesday, Iran’s leaders sought to respond by ordering state workers and students to take to the streets to support the government. The latest protests have largely been driven by economic discontent among the country’s poorest citizens who haven’t seen the benefits of the nuclear deal that allowed billions of dollars to flow into Iran, U.S. officials said. Much of the money, U.S. officials said, has gone to Iran’s military and intelligence services instead of to projects meant to improve life for average Iranians. This time around, the officials said, police and soldiers may be more reticent to conduct a widespread crackdown on demonstrators. “Protests about rice prices… are both tougher to smash, a far worse optic for the regime to smash and, frankly, causes that maybe resonate more among the people who would be called upon to drop the hammer,” said a second senior U.S. official. A third U.S. official said the administration was aware of the simmering economic grievances in Iran but that it was difficult to predict the eruption of protests. “While there were many indications of discontent, that was also true the week before and the month and the year before the protests,” the official said. The U.S. officials said they have no intentions of trying to push for regime change in Iran. “We’re just interested in getting the Iranian regime to change its behavior,” said the first U.S. official. But the U.S. is pressing its allies around the world to speak up in support of the Iranian protests and preparing to impose economic sanctions on groups and individuals that play a brutal role in suppressing dissent in Iran. The U.S. is pushing for an emergency session of the United Nations Security Council and the U.N.’s Human Rights Council. signature nuclear deal with Tehran. To keep the deal in place, the president will have to waive the sanctions in mid-January. Mr. Trump already has taken steps to pull his support from the deal, and has pressed European allies to join him in trying to renegotiate the agreement. Iran and EU leaders have said they won’t renegotiate the deal. European leaders have been reluctant to walk away from a deal that they say is working to contain Iran’s nuclear ambitions. But the protests in Iran, combined with the government crackdown, could give the Trump administration more ammunition in its criticism of the deal. U.S. officials said the domestic protests would be a factor in the president’s decision, but that they were still developing options for Mr. Trump to consider. The Trump administration has made deterring Iran a priority. Iran is deeply involved in conflicts stretching from Lebanon to Yemen. The U.S. is working closely with Saudi Arabia, Israel and European allies on ways to dilute Iran’s influence across the Middle East. The domestic protests have given some administration officials new hope that their emerging strategy could bear fruit this year. —Farnaz Fassihi at the United Nations and Nancy A. Youssef in Washington contributed to this article.